Ignition & dynamo set YAMAHA XS650 HR. Replaces complete stock ignition and alternator. The system is technically capable of running without a battery (which the stock alternator could not). If you want to use that option, please note our remarks on driving without a battery. No carbons, no collector, no points or govenor problems any more. No need to modify engine casing. 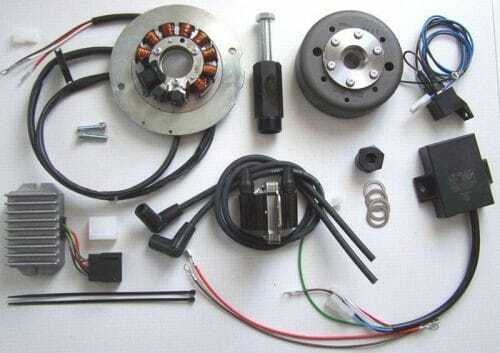 This kit contains a CDI unit, new flywheel / dynamo set 12 Volt 180 Watt, regulator/rectifior, ignition coils + cable, technical / installation manual.